Toma de Protesta/Our New Mayor | ¡VidaMaz! We have been very excited about the incoming mayor, Carlos Felton González. We first met him during the inauguration of the photo event up on top of the lighthouse. While all the other dignitaries were sweating and heaving with the effort of climbing up, Felton bounded up with energy and later ran down with great glee. He’s obviously fit. We see him in Playa Norte at many of our fair city’s athletic events, and were overjoyed this morning to hear his support for the ciclovías/bike lane plans that have been previously announced and so long in coming to fruition. One man alone can not make change happen, so we can only hope that his Cabildo, cabinet, committees, staff, and all ciudadanos can jump on board and make this new administration the best it can be for our beloved adopted hometown! 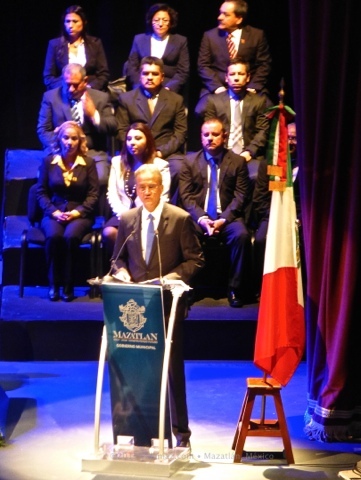 The swearing-in ceremony in the Angela Peralta Theater this morning began promptly at 8:00. 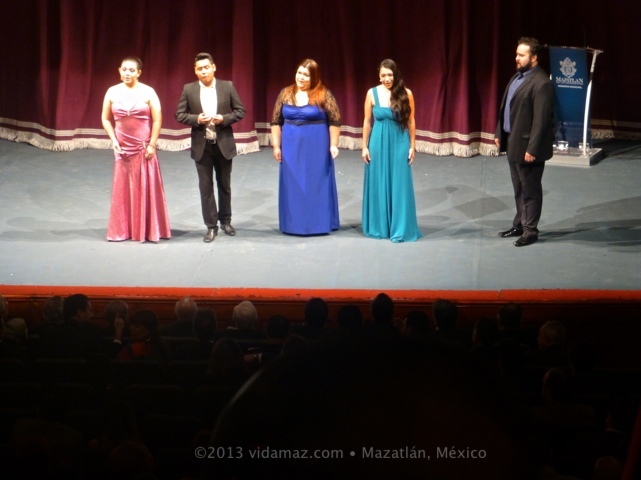 Five key opera singers from CULTURA regaled us for 30 minutes. While that took place, the official swearing-in ceremony—oaths of office—were taking place in the Cabildo. 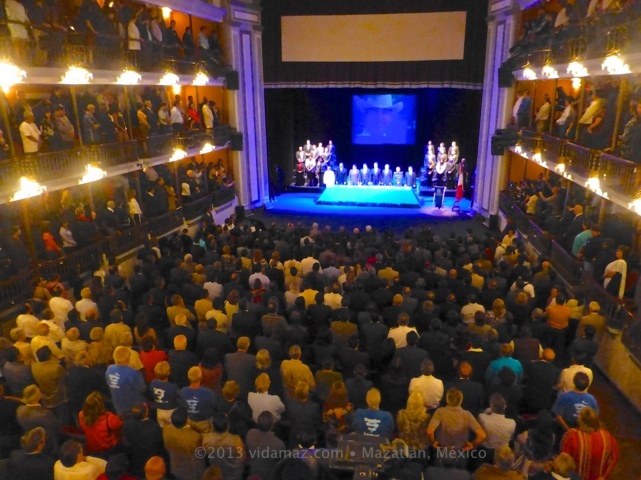 At 8:30 am, the dignitaries walked into the theater: the Governor of Sinaloa, Mario López Valdez; the Secretary of the Government, Gerardo Vargas Landeros; the Commander of the Third Military Region, Moisés García Melo; the Commander of the Fourth Naval Zone, Francisco Márquez; and the Governor of Durango, Jorge Herrera Caldera; and a stage filled with other prominent people. Click on any image to enlarge it or view a slideshow. Opening introductions and thanks took a full 10 minutes. What impressed me was the sincerity of those thanks—Felton mentioned so many people by name, describing his affection and respect for so many of them. He definitely seems to be a man not driven by pure ego, as is so often our political fate. The theater was over-filled, with dozens of members of the press standing to get photos, the ground floor and all balconies standing-room-only. A viewing area with seating had also been set up in the Plazuela Machado, with a huge screen streaming events from inside. Almost his very first comment was that he is a padre de familia, a parent, and that he is committed to a community in which families thrive, are valued, feel safe, and have the resources they need. Such values and priorities sure resonate with me. His commitment to reaching out to all citizens, and his commitment to serve—especially those who are poorest and most marginalized. He also talked of his commitment to the differently abled. His focus on creating a strong and sustainable economy here in Mazatlán, one in which our children, older and experienced adults—everyone—can find jobs worth having. His commitment to partnering with private industry and to retaining talent here in our port, rather than continuing the brain drain of our top talent to other cities, was music to my ears. 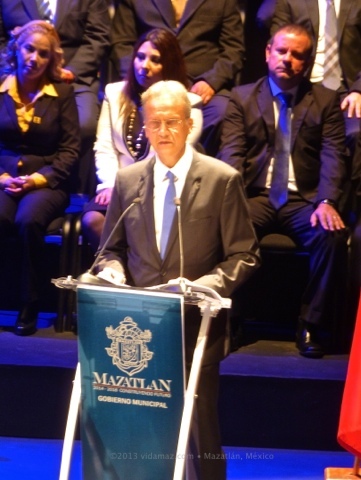 He thanked all foreign residents for their choice to live in Mazatlán, for the affection we show for this city, and for so often setting a good example for others in how to care for and show responsibility for creating the best living conditions possible. This was remarkable—one of maybe three times people interrupted his speech with applause. Given that 95% of the audience or more were locals, this was remarkable. He had another huge round of applause thanking the police and the military leaders for all their work in securing safety here in Mazatlán. Felton pointed out that no matter how much economic or tourism success we might have, if our port experiences violence, it’s all for naught. Again, it was refreshing to hear a politician giving others credit for the work they so ably do. I attend far too many events where you’d think the only capable person present is the one speaking. He quoted Khalil Gibran in closing, while thanking his mother, and also extended thanks to his wife and children. He recognizes that his public duties will mean less of him and his time for his family. For me, it was gratifying to hear public acknowledgement of that. After the official events (outgoing Mayor Higuera was missing from this event), Felton hosted a beautiful reception in the Plazuela, complete with empanadas, donuts, canapés, and nonalcoholic sangria/jamaica cocktails, served in champagne flutes. I was gratified to see that the public was welcome to this reception; many children and obviously lower income people were enjoying mingling with the city’s rich and famous. Playing was my favorite local band: videographer and talented singer Julio Recinos with La Falsa Orquesta Cubana Sazón. Given the perfect, sunny yet cool and pleasant morning and the gorgeous architecture of the theater and the Plazuela Machado, it all seemed auspicious, indeed! As we exited the theater, luck would have it that we crossed paths with Governor Malova, just in time for me to get a good morning kiss. We are all skeptical of politicians these days, sadly. We hear good words and take them with a grain of salt. It is my sincere hope that someone with such deep ties to Mazatlán as Felton has, someone who has over the years shown his love for our city and its downtrodden, someone married to someone as wonderful and values-focused as Sylvia Treviño, someone who loves sports, the outdoors, the environment, and who respects history and heritage as well as diversity, might have a hope of truly making a difference. May our city pull together and, as Felton says, truly transform itself! One final note: We shared with you recently the gorgeous dress that the town of El Rosario had created to honor its town. Evidently Mazatlán has taken their example, as today we witnessed the unveiling of two new dresses representing our port. Photos below. Thank you, Diane, for this summary of the event. 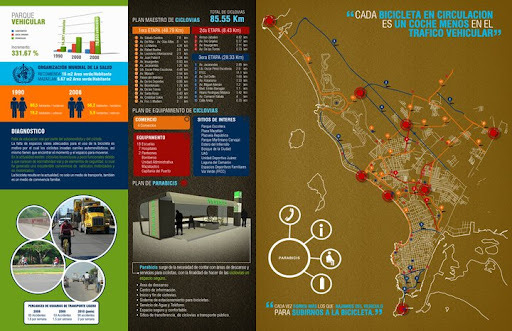 We all DO hope to see more good things to happen in the near future for Mazatlan. Very Happy New Year to you, Alana! I trust 2014 brings you loads of good things, and to our beloved Mazatlán as well! Thank you Diane. We were not able to attend this event so your narrative is much appreciated. I am so glad that you found the post helpful, Richard. Thank you for letting me know!